“I’m not really an East Ender, I’m more of a Bow boy,” asserted Alfred Daniels with characteristic precision of thought, when I enquired of his origin. “My parents left the East End, because they were scared of the doodlebugs and bought this house in 1945,” he explained, as he welcomed me to the generous suburban mansion in Chiswick where he lives today. 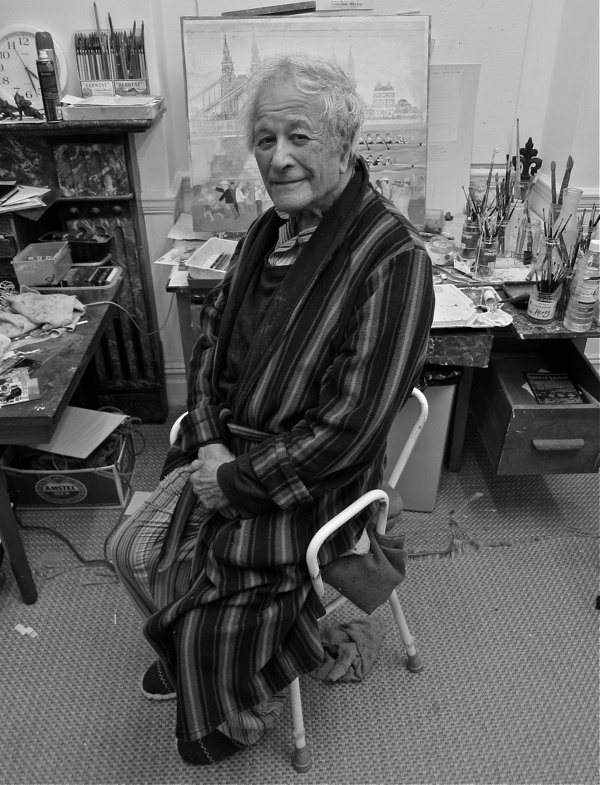 Greeting me in his pyjamas and dressing gown in the afternoon, no-one could be more at home than Alfred in his studio occupying the former living room of his parents’ house. And yesterday, he was snug in the central heating and just putting the finishing touches to a commission that his dealer was coming to collect at six. Alfred is at the point in life now where the copyright payments on the resale of works from his sixty year painting career mean he no longer has to struggle. “I’ve done hundreds of things to make a living,” he confessed, rolling his eyes in amusement, “Although my father was a brilliant tailor, he was a dreadful business man so we were on the breadline for most of the nineteen thirties – which was a good thing because we never got fat …” Smiling at his own bravado, Alfred continued painting as he spoke, adding depth to the shadows with a fine brush. 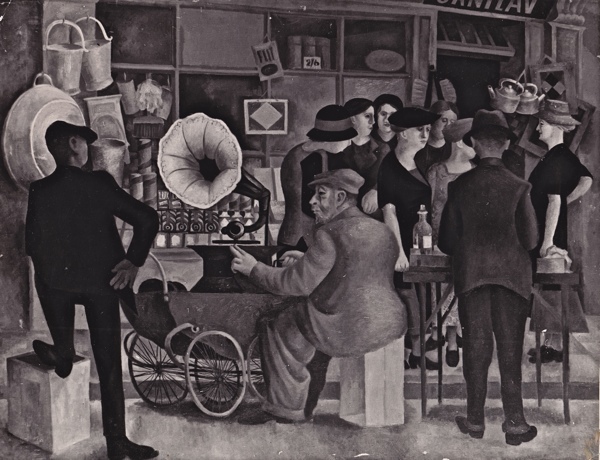 “This is the way to make a living,” he declared with a flourish as he placed the brush back in the pot with finality, completing the day’s work and placing the painting to one side, ready to go. “The past is history, the future is a mystery but the present is a gift,” he informed me, as we climbed the stairs to the upstairs kitchen over-looking the garden, to seek a cup of tea. Alfred had spent the morning making copious notes on his personal history, just it to get it straight for me. “This has been fun,” he admitted, rustling through the handwritten pages. “My grandfather came from Russia in the 1880s, he was called Donyon, and they said, ‘Sounds like Daniels.’ My grandfather on the other side came from Plotska in Poland in the 1880s, he didn’t have a surname so they said ‘Sounds like a good man’ and they called him Goodman. My parents, Sam and Rose, were both born in the 1890s and my mother lived to be ninety-two. I was born in Trellis St in Bow in 1924 and in the early thirties we moved to 145 Bow Rd, next to the railway station. I can still remember the sound of the goods wagons going by at night. One good thing is, I gave up the Jewish religion and thank goodness for that. It was only when I was twelve and I read about the Hitler problem that I realised I was Jewish. Fortunately, we weren’t religious in my family and we didn’t go to the synagogue. But I went to prepare for my Bar Mitzvah and they tried to harm me with Hebrew. We were taught by these Russians and if you didn’t learn it they bashed you. That put me off religion there and then. Yet when we got outside the Black Shirts were waiting for us in the street, calling ‘Here look, it’s the Jew boys!’ and they wanted to bash me too. Fortunately, I could run fast in those days. My mother used to do all the shopping in the Roman Rd market. She hated shopping, so she sent me to do it for her in Brick Lane. It was a penny on the tram, there and back. But they all spoke Yiddish and I couldn’t communicate, so I thought, ‘I’d better listen to my grandmother who spoke Yiddish.’ I learnt it from her and it is one of the funniest languages you can imagine. Although my parents were poor, my Uncle Charlie was rich. 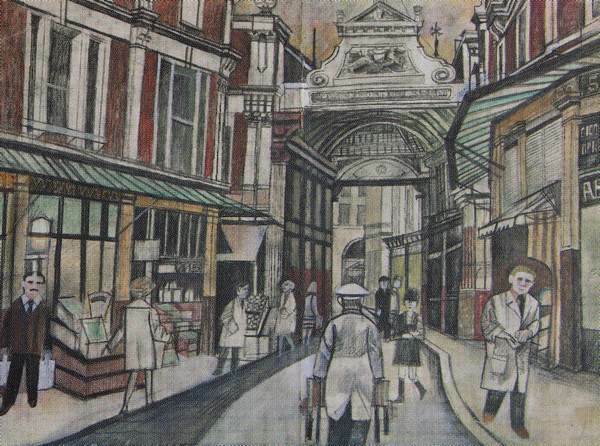 He was a commercial artist and my father said to him, ‘The boy wants to learn a craft.’ So Charlie got me a place at Woolwich Polytechnic to learn signwriting but I spent all day trying to sharpen my pencil. 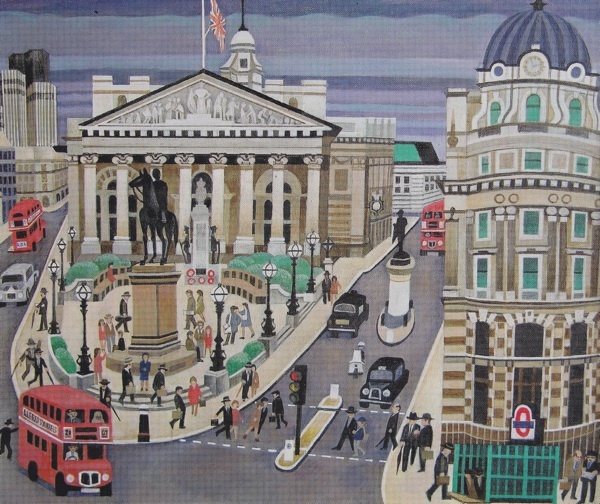 Then he took me out of the school and got me a job as a lettering artist at the Lawrence Danes Studio in Chancery Lane. It was wonderful to come up to the city to work, and his nephew befriended me and we went to art shops together to look at art books. We drew out letters and filled them in with Indian Ink, mostly Gill Sans. Typesetters usually got the spacing wrong but if you did it by hand you could get it right. It was all squares, circles and triangles. When Uncle Charlie started his own studio in Fetter Lane above the Vogue photo studio, he offered me a job at £1 a week. Nobody showed me how to do anything, I worked it out for myself. He got me to do illustrations and comic drawings and retouching of photographs. At night, we went down in the tube stations entertaining people sheltering from the blitz. I played my violin like Django Reinhardt and he played like Stefan Grappelli, and one day we were recorded and ended up on Workers’ Playtime. Alfred was keen to enlist, “I wanted to stop Hitler coming over and stringing me up !” – though he never saw active service, but the discovery of painting and of his signature style as the British Douanier Rousseau stayed with him for the rest of his life. 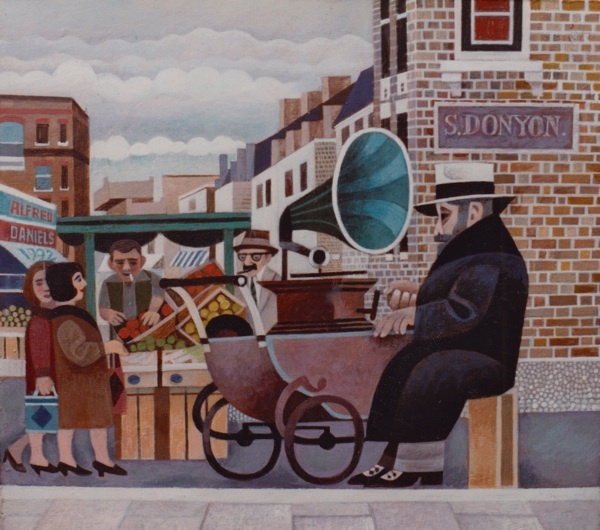 After Alfred left the East End in 1945, he kept coming back to make sketchbooks and do paintings, often of the same subjects – as you see above and below, with two images of the Gramophone man in Wentworth St painted fifty years apart. 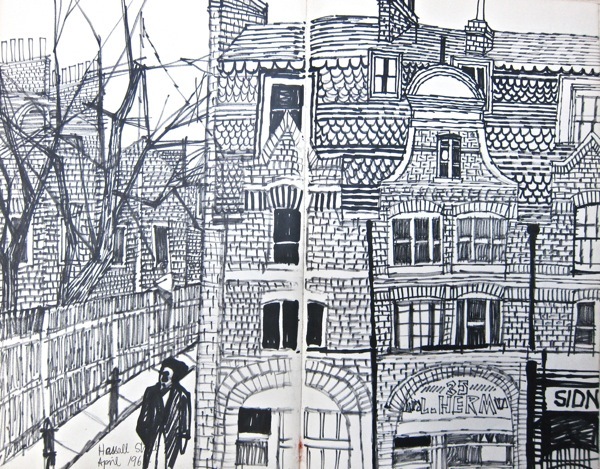 Sketchbook pages – Cable St, April 1964. 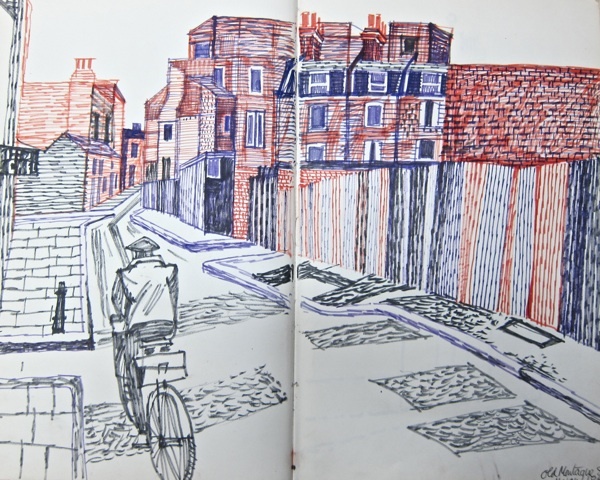 Sketchbook pages – Old Montague St, March 1964. 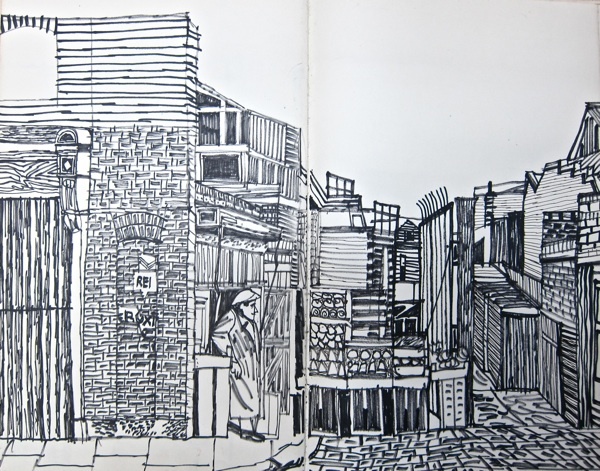 Sketchbook pages – Hessel St, April 1964. 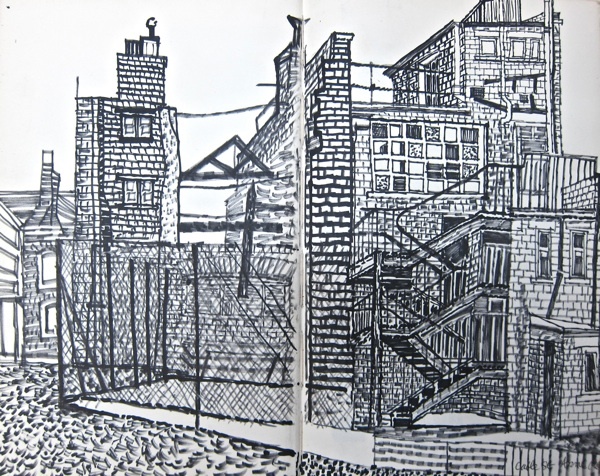 Sketchbook pages – Old Montague St & Davenant St, March 1964. 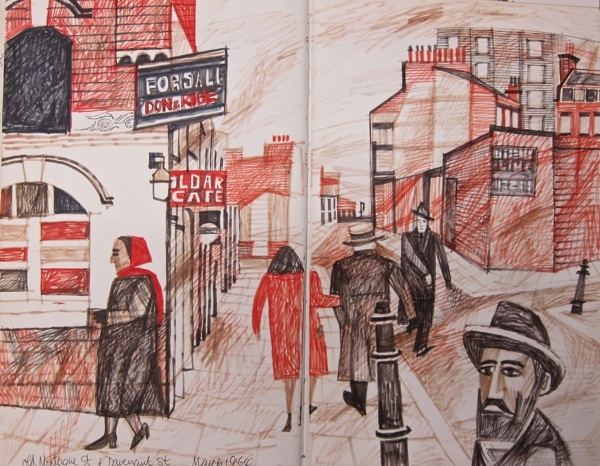 Sketchbook pages – Fruit Seller in Hessel St, March 1964. Althought this style of painting and drawing looks “naive” it actually is very detailed and like impressionism also gives a feeling of movement and reality that is hard to convey in other formats. An intriguing gentleman. Thank you for another great portrait. Would love to buy one of his pieces. Is he exhibiting anywhere currently? Lovely piece on Danny – you’ve done him proud! Thank you. One of my favourite pieces so far. Now I wonder how much those pictures are…I’d love a few on the walls! 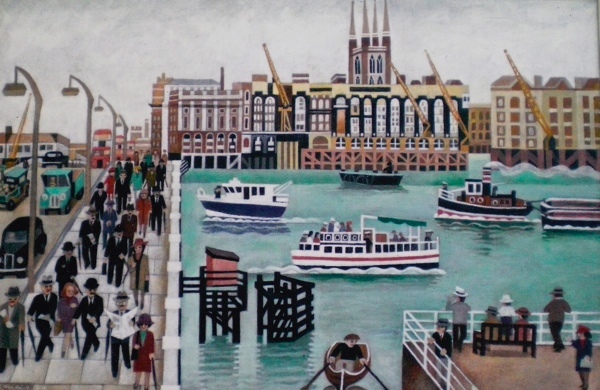 Lowry for Londoners – but without the Northern angst. I love these and would own every one if I was minted. Great life story too. I look forward to living in my dressing gown when I am 88. Alfred’s work is absolutely delightful! brilliant. 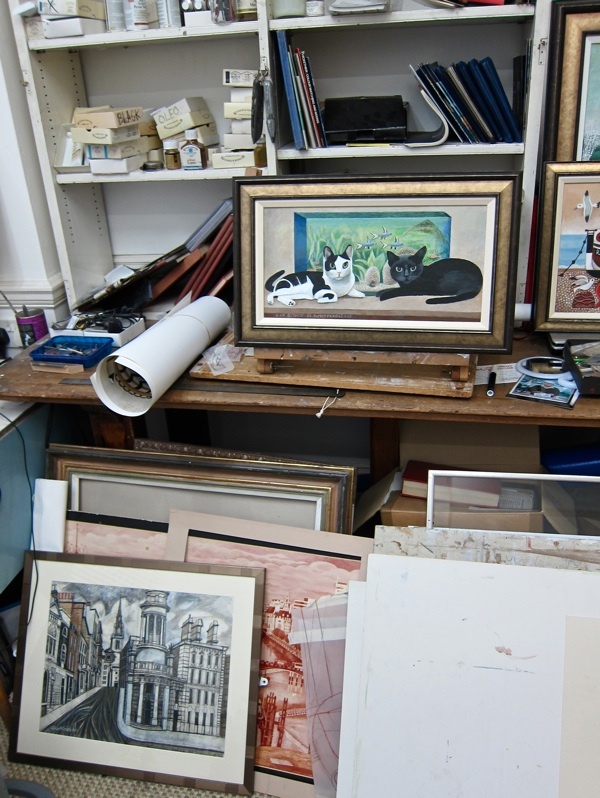 Love the two cats painting. 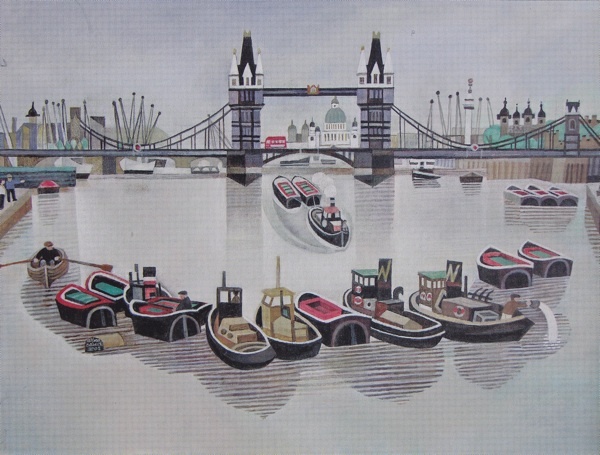 I saw two pictures by this guy at the Bankside Gallery today. One recent one of a cat on Hastings beach – which seems to be a signature theme of his – and a really lovely little street scene from 1960 called Yellow Cello, centring on a busking cello player. Wish I could have afforded to buy it. (Alfred Daniels) Danny, taught me how to make fresh mayonnaise at My Great Auntie Lilly’s. That was the start of my love affair with good quality food from the simplest of ingredients. 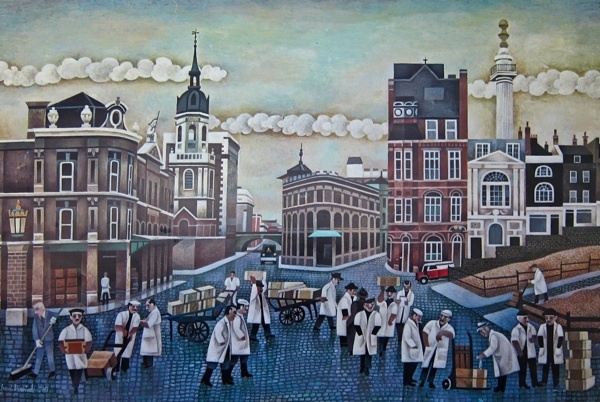 His work also inspired me for my own Art O level back in 1982!!!! some time ago now. I tried to copy his style from a Brighton pier and sea front painting (that my parents had) and the examing board loved it, unbeknown to them. My school also used his “How to paint” books after that. 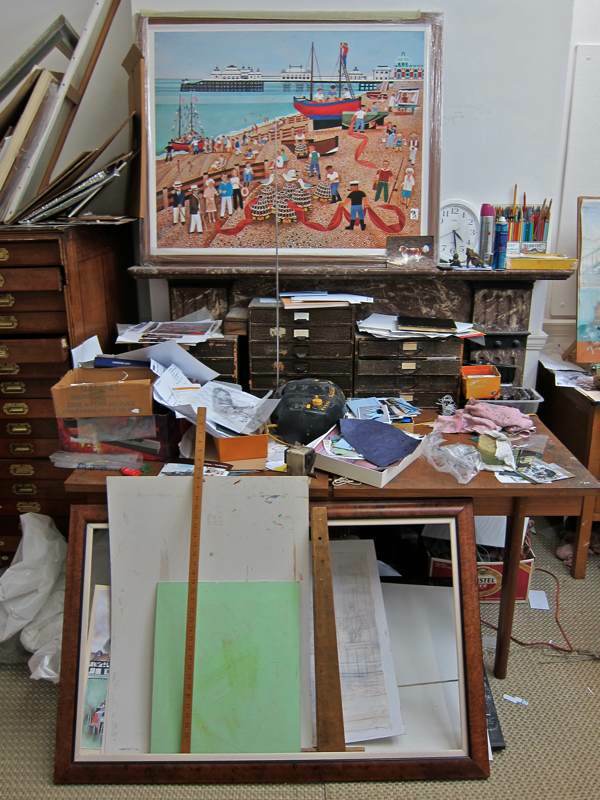 I love all of his work and the long duration of his most eminent career as an RA Artist. Great Britian is so lucky to have such a wonderful Artist. Long may he continue in good health. I’m another former student and was tutored by Danny at Sir John Cass in the mid 1980′s. A delightful fellow with a vivacious character who inspired many with his obvious passion for art and his enjoyment of life. Danny is my Uncle, and I,ve always loved his work. Unfortunately I’m the one member of the family who had no artistic talent whatsoever. My Father( Danny’s Brother Dennis) was a commercial artist. I remember one frustrating afternoon at my Grandparents when Danny tried to teach me to draw a chair, and he just could’nt understand why I could’nt do it. I got my own back a few years later when trying to teach him to bowl leg breaks and googlies, he just could’nt do it, can’t understand why. Thank you for your work, it’s fantastic!